This composer-authorized edition was prepared by Theodore Norman (to whom Krenek's 1957 Suite is dedicated) from Eight Piano Pieces (1946). Each piece explores different aspects of twelve-tone rows, and many textural elements are brought out by the duo setting. Four of these works are available on the Elgart/Yates Music of the 20th Century recording. 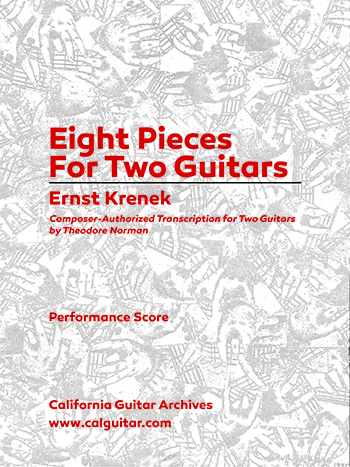 Norman...has exercised fine judgment in choosing to transcribe these eight short pieces...recommended to the aspiring and more established guitar duos. Transcribed from Eight Piano Pieces by Theodore Norman.